....is what I hope your Friday has been full of today!! Tee hee!! Today is our last night in Sheridan...and the guys are out hunting for the last time tonight. So far they have been skunked, which is very unusual for this area. Josh is going to see if he can go out around Missoula on his days off to try and get his elk still...I sure hope he does! We take Josh's dad to the airport early tomorrow morning, and then will head on our way home. I ADORE this stamp set by Taylored Expressions...it has so many fabulous images! I see myself using it often in the coming months!! It is full of whimsical images and beautiful sentiments...just love it!! I also have the winner to announce of the Skipping Stones Design "Grunge" stamp set from my Tuesday post! Without further ado...here is the randomly picked winning comments!! Yay Christi...congrats!! Email me your address information to jnllawson @ bresnan.net...and I will get the stamps sent out to you!! 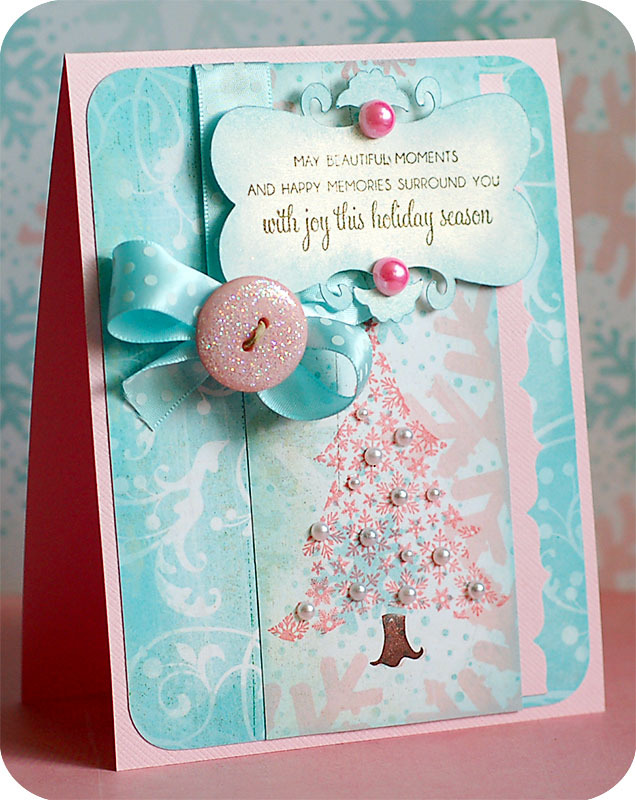 Love these soft colors...Just a Beautiful Holiday card!! i absolutely adore the colour combo... your card is gorgeous! Stunning card Lea! Love the pretty color combo and all the pearls! This is so fun with the non-traditional colors, tree pearls and sparkly button. Love your stile Lea - beautiful cards! This is just STUNNING! I love the soft colors, and the pearls on the tree look marvelous! I'm in love! These are some of my favorite colors for Christmas and the pearls and sparkle make it even better!! This card is stunning, Lea. I love the colors and the pearls so much!